Of Oxenden, and previously of Wiarton and Red Bay, peacefully at home on Thursday, November 20, 2014. Daphne Margaret Jamieson (nee Dillon-Gibbons) at the age of 91. Loving mother of Sharon Bird, of North Bay, and Ginnie Spano, of Oxenden. 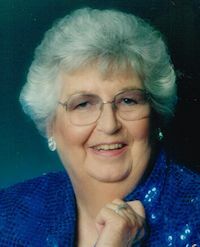 Beloved grandmother of Michelle, Heather, Stephen, and Brian Bird; Dennis, and Paul Jamieson; and William, and Robert Spano. Great-grandmother of 11. Survived by daughter-in-law Patricia Jamieson. Predeceased by her husband Bill (1988); son Doug; brothers Philip and Leslie; sisters-in-law Marjorie Noble and Jean Jamieson; and son-in-law Peter Bird. Daphne was a War Bride who emigrated to Canada to share a life with her husband Bill. She loved living in Red Bay, and will be remembered by all for her volunteer works, especially with the Wiarton Hospital Auxiliary. Family invite you to gather with them at the Thomas C. Whitcroft Peninsula Chapel, 272 Berford St., Wiarton (519) 534-5341 on Tuesday, November 25 for a service to celebrate Daphne’s life at 12 o’clock. Visiting from 11-12. Cremation has taken place. Spring interment in Red Bay Cemetery. Donations to BPHS Wiarton, or Canadian Diabetes Association.